Day 1 - Doi Suthep temple, Vieng Kum Kham and handicrafts - This tour starts at 9am. You are picked up from your hotel by your guide. First drive from your hotel up to Doi Suthep Temple, which is approx. 12kms from downtown Chiang Mai. 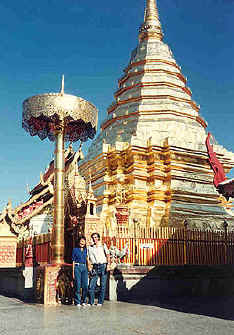 The majority of the route is a winding uphill journey passing through Doi Suthep National Park. At the base of the hill you will pass Chiang Mai Zoo and the Kruba Srivichai Monument. At the end of the journey, we leave the car at the base of the temple steps. You can reach the temple by climbing the 190 steps or by taking the small "cable car" to the top. Once at the temple you can admire the magnificent views over the temple valley as well as the temple atmosphere and architecture. The highlight is the inner sanctum which houses the enormous golden stupa. Drive down from Doi Suthep and have lunch. On the way to the handicraft centres visit the ancient site of Chiang Mai at Vieng Kum Kham, and walk around the ancient city site of King Mengrai (the founder of Chiang Mai). Afterwards visit some of the many handicraft villages in the Sankamphaeng area. As well as seeing products you will be able to see how they are made. Products include - celadon, silver, furniture, jewellery, lacquerware, silk, saa paper, handmade umbrellas and more. Plenty of opportunities for buying bargains and beautiful handmade products. Day 2 - One Day Trek, Mini Adventure - Pick up from your hotel at 8am. Drive 45 mins. to the south-west of Chiang Mai. Arrive at the elephant camp and ride on the elephants for approx. 1 hr. Drive on to a Karen village, where we start a 2 hr. hike through the forest. We pass a number of waterfalls on the way; you can cool off with a refreshing swim. We end up at a Karen village, where there's time to rest and explore. Lunch is had along the way or at the village. After exploring the village walk for 1 hr. to the pick up point, and then drive to the start of the rafting trip. Travel down the river on bamboo rafts for approx. 1 hr. Then drive back to Chiang Mai by approx 5pm. Day 3 - Thai Cookery Course - Take a one day Thai Cookery course at the Green Mango Thai Cookery School. The day includes a visit to the market, preparation of curry paste from scratch, explanation of rice preparation & cooking, and the cooking and preparation of five Thai dishes. Also tasting of Thai fruits or dessert. The course runs daily and menu varies according to day. Pick up and drop off from/to city hotels and guesthouses is included. You get your own recipe book to take home. Note: This is a private tour (except for the cookery course), lunches and entrance fees are included. This tour is a private trip to visit Doi Suthep Temple, handicraft centres, a one day trek with plenty of hiking as well as elephant riding & rafting and the one day Thai cookery course (join in group). 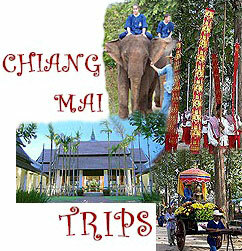 Varied trips, including elephant riding and bamboo rafting, moderate hiking, temples and Thai food. A good variety trip suitable for the reasonably fit. Pick up and drop off at your hotel. (please note this price does not include accommodation).